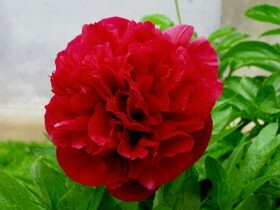 Peony – popular varieties, reproduction, growing, care, photo and video. Peonies – kings of the garden landscape. Large flowers, large leaves, high resilience and resistance to frost, longevity – all of this peony. Lush bushes – a great decoration of the garden landscape, intoxicating subtle scent fills the space, colors allows you to create a bright and exquisite compositions. Plant care simple, but planting and breeding requires certain knowledge and experience. 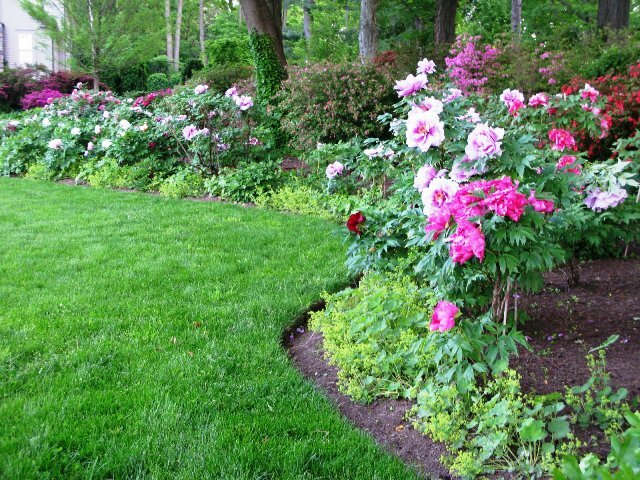 Peonies are planted for the decoration of lawns, one variety is planted in large arrays, large solid spots contrast with the background greenery. Plants can be supplemented with ridges and beds, clumps and tapeworms. Bushes can be planted near trees and shrubs, the edges of the lawn, for this purpose it is better to use medium and tall varieties. Low plants will successfully revive the composition of the stones, Alpine slide. Bright colors will temper the monotony of a long fence, tight fit highlight and underline the path in the garden. Until, while the bushes will not grow, it is possible to plant delphinium and Phlox, Lupin, Mac, Brunner, alyssum, early bulbous: crocuses, snowdrops, tulips and daffodils. An interesting option: fit white, pink and red varieties in the background of the hedge of wild rose bushes. Between blooming in June peonies can be planted in July the daylilies, and the ridges with colourful plants are edged pale pink lavateras, which also blooms in July and will give already faded varieties of picturesqueness. Well crimson and pink flowers with blue lavender and dark purple irises. 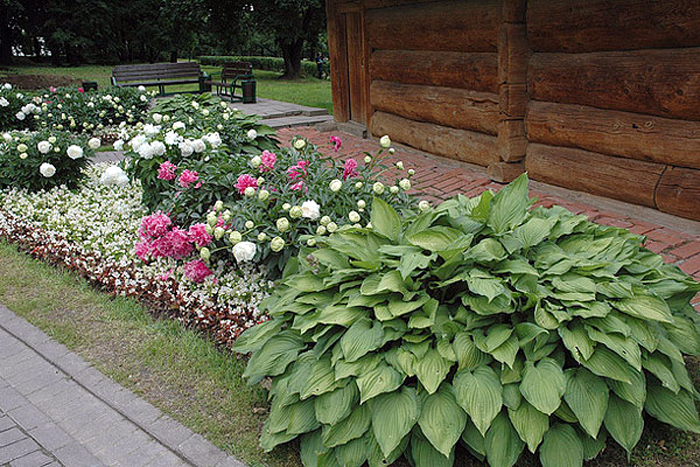 Looks perfect flowerbed of the three colors partner: raspberry, white and pink. Another win-win – landing next to the conifers. The name of the flower is derived from the word "aionios" – "curing"". 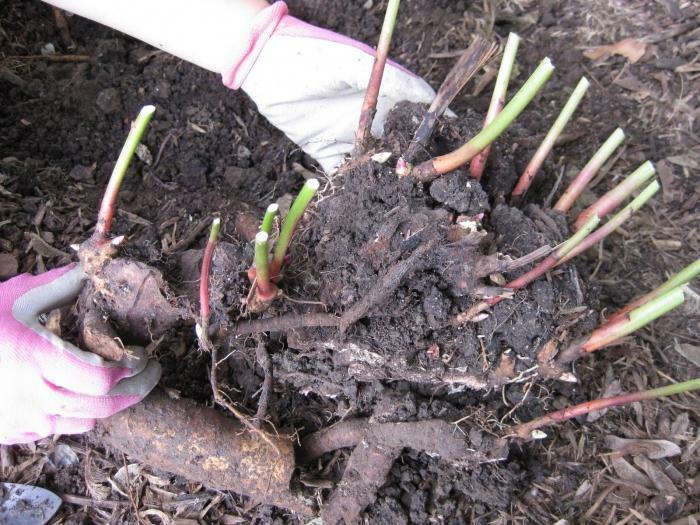 Ancient Greeks believed the rhizome of the plant healing, able to protect from evil spirits, to remove the cramps. With this purpose did the charms: dried slices strung, like beads and worn around the neck. The combination of the planting of peonies of different flowering periods, you can get a bright garden accents for several months. If the time to remove the apical and lateral buds, you can achieve a long and abundant flowering. Also varieties can be distributed in color. Burgundy: "Revard", "Red Ensign", "Red Dandy", "Red Charm", "Red Comet", "Sable", "Sword Dance". Red: "Red Red Rose", "Sunshine", "Sky Queen", "Spot Song", "Felix Krause". Raspberry: "Red Monarch", "Red Romance", "Rubra Trimans", "Rosedal", "Thomas Options". Pink: "Raine Hortens", "Ruth Kobza", "Rubens", "Rose Noble", "RosALit", Sarah Bernhardt", "Solange", "Stephania", "Celebration", "Suzette", "Fan Tan". White: "Rosemary Lins", "Painted Dessert", "Primaver", "The Solfatara", "Suzanne Brown", "FESTIVA Maxima", "Frances Willard", "Advans". Yellow: "Chairman Moon", "White Sands". Pink peonies in different shades in the garden. The easiest and most affordable method of reproduction – the division of the Bush. It is applicable to all varieties, thus it is possible to obtain planting material or upgrade the old plant. The best time for the procedure – from mid-August to mid-September, the plants should be older, three or five-year. If the summer was dry, deadlines can be postponed until November. 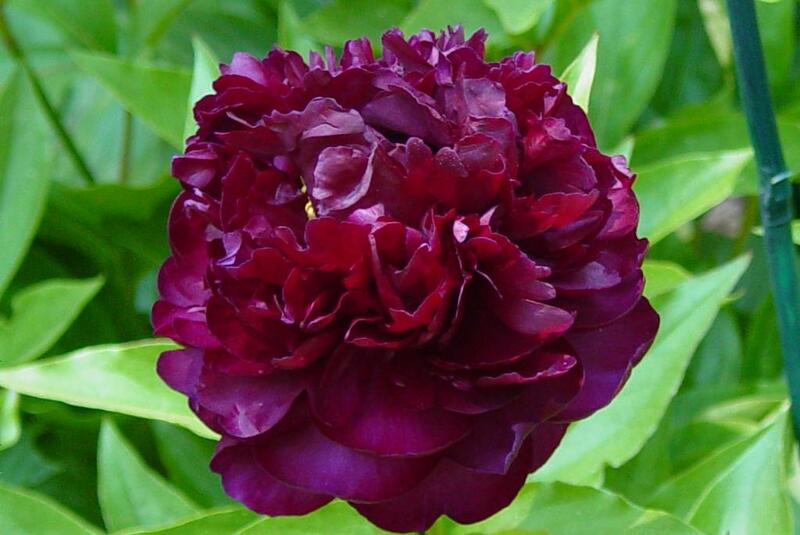 Peony is equipped with a powerful and extensive root system. Around the Bush to dig the groove, and then carefully dig it from the bottom, the stems thus it is better to tie up. The pion extracted from the earth on the shovel, holding branches. The root system needs to be washed out on flat ground to drain by using a watering can or hose. Shoots pruned to a height of 8 cm, the remains of the soil is removed a peg or washed in water containers. Broken roots to explore, cut and sprinkle with crushed charcoal. Split Bush is better in the area jumpers, using a sharp knife. These seedlings must have a length of rhizomes of not less than 15 cm, a few buds on the root neck to resume, three or four leaf on the stem. All of these conditions are required for optimal survival of peony. The old bushes are very overgrown and heavy root system can be divided directly in the pit, lifting undermined plant. A Bush is divided into several parts, and then pulled out of the ground. Received of the landing units, it is recommended to plant immediately, in the fall, the new location, for rooting. Persistent and longstanding peony can grow without a transplant to ten years, all these years it blooms profusely. For planting is best to choose a sheltered Sunny or lightly shaded areas. As protection from the elements, you can use a "wall" of bushes. The plant does not like wet, waterlogged soil, shadow. The lack of light contributes to a strong stretching of the stems and poor flowering. Option planting peonies at the lower sections can be high beds and drainage thick 20 cm of gravel, broken bricks and coarse sand. The soil around the plants is mulched with bark. For planting suitable sandy loam, clay or loamy soil, - neutral pH level. 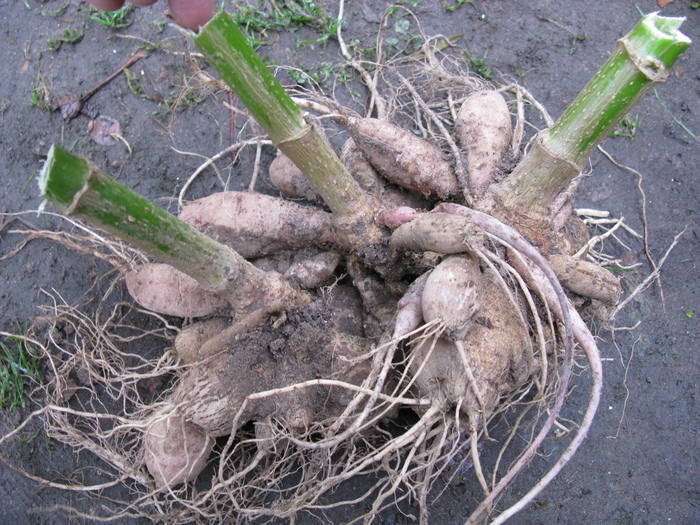 The root system is actively growing on sandy soils, the peony blooms early, but not so abundantly, like plants, planted on loam. Sandy soils contribute to a good development of foliage, flowering is scarce, Bush can quickly age and lose the decorative. To improve sandy soil, you can use any of the peat and clay, nutrients. Clay soils are preferable, them bushes grow well, richly and colorfully bloom for a long period, they are less prone to diseases. Additional enrichment of the soil before planting helps pre-sown Lupin. Peonies are planted in autumn, in the Northern regions – from mid-August, in the South in October, in the middle lane – at the beginning of September. Spring planting is possible, but risky: plants do not grow and develop. The hole for planting should be wide, the length and depth at 70 cm, it is better to prepare in advance, for several months before planting, positioned in a checkerboard pattern. Depending on residentsto adult shrub planting pits located at a distance from 60 to 120 cm. For mass planting, dig a trench. The bottom of the pits or trenches loosened to a depth of bayonet spade, then fill with a mixture of peat, garden soil, rotted manure, compost, ash, bone meal and superphosphate. After filling the wells should be well watered, do it for the entire period before planting. As the sedimentation of a mixture of soil spiked. Just before landing in the centre of the pits, make small holes to 30 cm. Rhizome powder with HCH and planted the bushes so, to the kidneys resume was a layer of earth in 5 cm. New planting liberally moisturize, hilling and mulching with peat or compost. 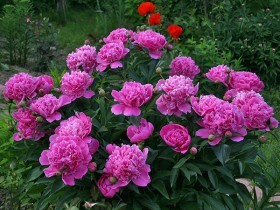 Deeply planted peonies may not bloom, and planted small – to freeze solid. Too thick planting after some time you can sit down. 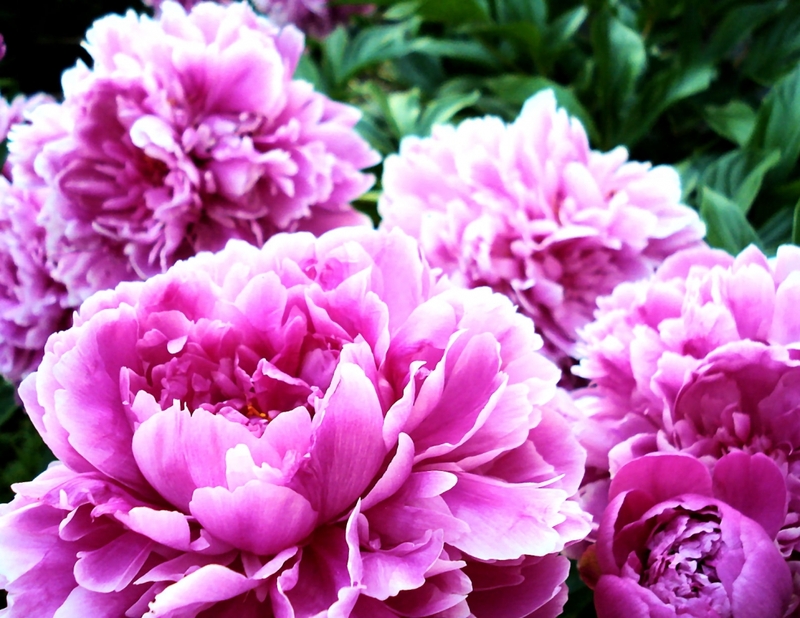 Peonies are hardy and don't require constant attention, however, it is necessary to take certain measures, to the bushes is well developed and actively bloomed. 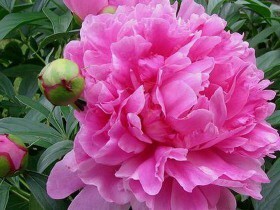 Peonies are big fans of moisture, watering is the most important procedure for this type of plant. Lack of water leads to the formation of small flowers. For a constant flow of air to the roots necessary to timely weeding and hoeing. Prolonged rainy weather can contribute to lodging the bushes. To prevent this, gardeners use props in the form of rods and garter wire. Wither part of the plant is cut, and at the end of October, the stems are pruned to a size of 20 cm from the surface of the earth. 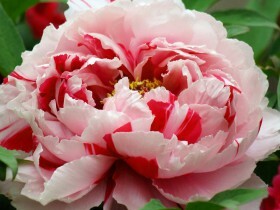 Peony is easy to tolerate even extreme cold down to – 40 degrees. Before wintering the bushes need to till and mulch with compost, rotted manure or peat. In the first year of the new plant not fertilized, but regularly loosen the soil and watered. Young buds it is better to pinch back, this procedure promotes the formation of a profusely flowering shrub in subsequent years. 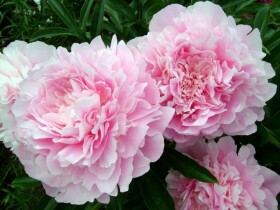 For the second year peonies can be fertilized moderately, the side flowers are plucked, leaving only the Central. 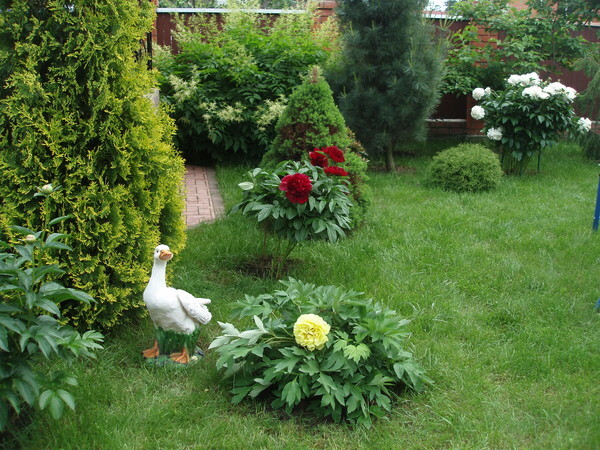 After flowering care for the bushes continue: loosen the ground, weeds are removed, pour. 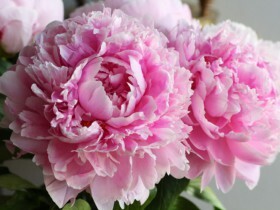 In the third year and subsequent peonies fertilize actively, continuing to perform the same work, as in the previous period. The first shoots appear on the plant in April or may. At this stage the flower needs the nitrogen. In June, in the stage of budding, the bushes also need nitrogen, potassium and phosphorus, at the end of flowering, in July, in the soil contribute phosphorus and potassium. Experienced growers recommend to fertilize after watering or rain. Spring feeding – 60-70 g of nitrogen fertilizer per Bush. May feeding – bucket solution with bird droppings, mullein. The September feeding – 10-15 kg of humus and 50 g superphosphate. October fertilizing – deep digging, 30-40 g phosphate and potash fertilizers, 15 kg of compost or fermented manure. All of these recommendations will help the proper development of plants and its lush blooms. Peony affected latent ring spot, programmost tobacco, ring spot of raspberry, mosaics cucumber and alfalfa. These viral diseases are spread contact, through the soil, insects, poor-quality planting material. The plant can be affected by fungi: Botrytis, rust, different types of spotting. Disease is favored by warm and humid weather. Weakened plants may not survive the winter or not bloom next year. To avoid such troubles, should pay more attention to prevention. Need to purchase healthy proven planting material from reliable and reputable manufacturers. Compliance with optimal farming techniques and favorable conditions will strengthen the self-defense of plants. If trouble came to the garden plot, affected plant parts should be cut and burn. The remaining shoots treated with liquid Bordeaux, cinerom, fundazol, oxychloride of copper. All content on this site SamDizajner.ru written specifically for Simdesigner, copying 1 in 1 strictly prohibited. Reprint, full or partial rewriting of the article “Peonies – garden riot of colors”, possible, only when you specify the full, active link to the source.